Do you want to eat truffles ? Don't hesitate anymore and test its strong taste. To add truffle can change a simple meal in a so amazing plate ! 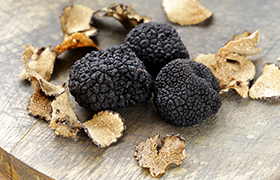 Jean d'Audignac proposes a large range of truffles from Perigord (tuber melanosporum) : chunks, pieces, whole truffles... but you can discover carpaccio and truffle juice which are so easy to use in cooking. More information about our truffles references on your private account on sdprungis.com !